Thera Band Tubing is an alternative to conventional free weights or elastic bands. Athletic Trainers prefer it because the color resistance levels are the same as Thera Band Exercise Bands used in physical therapy. It is also used in occupational therapy, orthopedics, pediatrics, sports medicine, home health care, geriatrics, hand therapy, and Chiropractic. 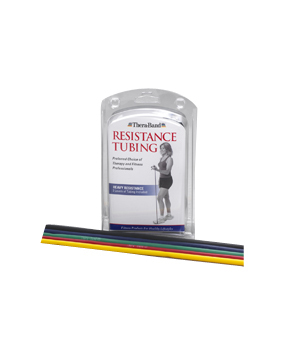 This set is unique because it contains three light resistance Exercise Tubing, and is perfect for exercises that require less resistance.